I always try to keep a wide variety of cereal on hand. I need a good bowl right before sleep, or the sleep just won’t work. I wake up angry and depressed. If I do have a bowl of cereal before sleep, I only wake up depressed. You can’t just have one type of cereal on hand, either; especially if you keep your cereal in the kitchen (I keep mine in my room, to avoid thievery). There is no excuse for having just a couple kinds; it’s a sign of being either a boring person or psychotic. Who can eat just one kind all week? You? Fine. Screw you, go away. You also need a variety of bowl sizes. If you have a normal size bowl, you can fill that up with some Frosted Flakes or Basic 4 or something, and you’re good to go. But what the hell are you going to do when you want some Crunch Berries or Kix? Those things are going to fly out of the bowl as soon as you add some milk. And God help you if you try to get some Honeycombs in there. Would a professional chef use one kind of knife to cook a whole meal? Maybe, I don’t know. I don’t think so, though. I keep some normal bowls for the small cereals, some Cool Whip containers or quart size wonton soup containers for the big ones, and a shot glass for some Grape Nuts. So I like to think I’m pretty prepared for any cereal emergency that may occur. This was, until the other night when I had no cereal. That’s right. How this happened, I don’t know. I checked the downstairs supply, and it was a sad, sad sight. The Reese’s Puffs bag had not been properly scrunched down into the box, leaving the helpless puffs exposed to the harsh air of the cabinet. There was also Berry Berry Kix, but I wasn’t that desperate. I suppose I could have picked the vile berry puffs out and eaten the Kix plain, but they would have been tainted. I had to resort to a supply of cereal I never thought I would actually eat: souvenir cereal from Germany. I ate a bowl of Zauberfleks, the “Schoko” flavor. 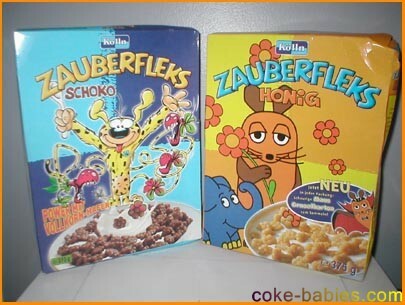 I thought I would have a lot of things to say about the wacky German packaging, but I got tired of looking everything up on Babelfish. I could figure out that “Schoko” was chocolate, even though the site found no direct translation for it. The character on the box is crazy, it’s some marsupial thing. The peculiar thing about it is its tail, which seems to be sprouting flowers and Venus Fly Traps. The cereal itself was mediocre, I certainly wouldn’t buy it again. You can see from the pictures that it looks like something even Malt-O-Meal would be ashamed to release. I rather preferred the packaging of the “honey” flavor. It looks like they just stole some pictures from a sticker packet or a Sunday school felt board. The almost disturbingly generic design is somehow enjoyable. 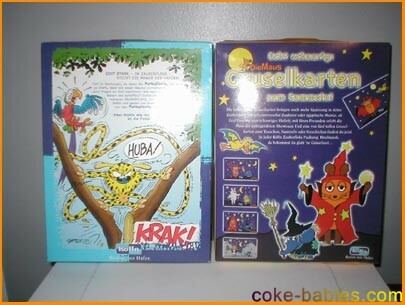 Babelfish also had trouble with whatever the bubble on the box cover says, something about “Cruselkarten Mouse”. 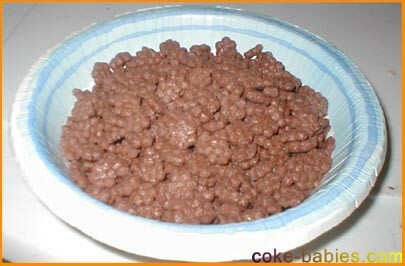 The cereal itself was, like the “Schoko” flavor, very blah. 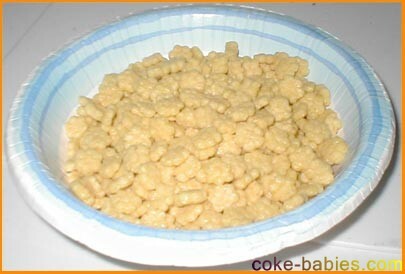 It tasted like the generic C-3POs, Mr. T sweetened corn puffs. 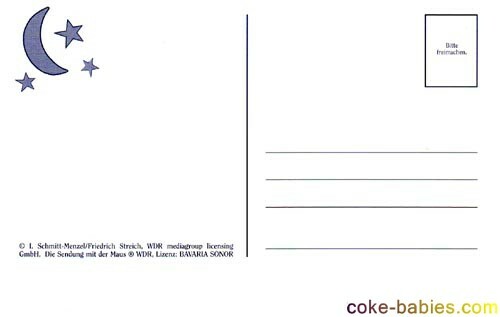 The cool thing about the Honey flavor was that it came with a postcard. Not one you had to cut off the box either, so that’s a plus. 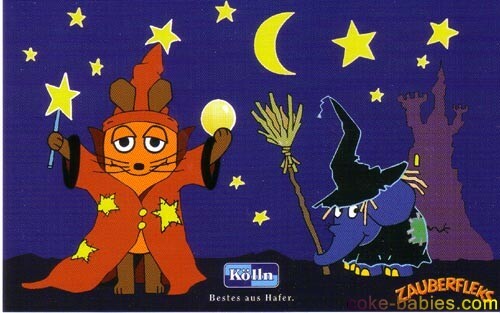 When you want to send a friend the message “Kölln: Best From Oats,” this postcard will do the trick. So for your sake, and for the sake of our nation’s economy: when making important cereal purchasing decisions, always buy American.